The Checkbox allows users to select a binary option from a list of one or more items. Popovers and Tooltips are supported. addItem(item, type) Adds an item to the end. type can be "checked" or "disabled" . Runtime. clear() Clears all items. Runtime. footer An optional message at the bottom of the list of items. Design Time and Runtime. getValue(i) Get the value (true or false) of line i. Runtime. header An optional message at the top of the list of items. Design Time and Runtime. icon An optional icon to appear at the top of the list. Design Time and Runtime. inline Display items horizontally? Design Time. items Items to show, one per line. Prefix * for disabled, > for selected, ! for heading (not all controls support headings). Design Time. length Items to show, one per line. Prefix * for disabled, > for selected, ! for heading (not all controls support headings). Design Time. setValue(i, value) Set the value (true or false) of line i. Runtime. value Sets or gets the value. 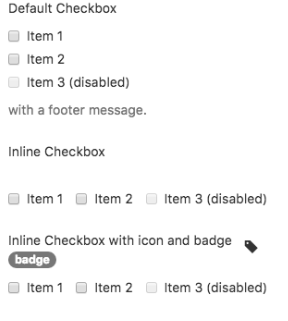 Bootstrap 4: Gets or sets true/false for single row checkbox. Standard events are supported. For this control, the onclick event will be most useful. Dim choices = "Choices: "
If Checkbox1.getValue(i) Then choices = choices & i & " "
This page was last edited on 10 March 2019, at 14:29.